Vaccinations are a way of life in the U.S. Military. All new recruits (both officer and enlisted) are vaccinated against various diseases during enlisted basic training or during officer accession training. The below table shows the standard vaccinations given to United States military personnel. While many vaccinations are given during basic training, other vaccinations (and/or "booster shots" are given at various times while in the service, and some are given only to certain designated personnel, or for assignment/deployment to various locations around the World. Also, if you are a military dependent and use military medical facilities, Tri-Care Services and/or Military Child Care, you must comply with the DOD policies contained in Joint Air Force, Army, Navy, and Coast Guard publication (AR 40-562, BUMEDINST 6230.15A, AFJI 48-110, CG COMDTINST M6230.4F) update released 29 September 2006. Air Force recruits receive adenovirus vaccination only when there is evidence of active disease transmission. Coast Guard Recruits only receive this when specifically directed by the Coast Guard Commandant. Measles Mumps and rubella (MMR) are administered to all recruits regardless of prior history. Quadrivalent meningococcal vaccine (containing A, C, Y, and W-135 polysaccharide antigens) is administered on a one-time basis to recruits. The vaccine is given as soon as practicable after in-processing or training. This vaccine is required routinely only for recruits, although its use may be indicated in other situations based on transmission potential and risk of contracting a meningococcal disease. A single dose of trivalent OPV is administered to all enlisted accessions. Officer candidates, ROTC cadets, and other Reserve Components on initial active duty for training receive a single dose of OPV unless prior booster immunization as an adult is documented. A primary series of tetanus-diphtheria (Td) toxoid is initiated for all recruits lacking a reliable history of prior immunization in accordance with existing ACIP guidelines. Individuals with previous history of Td immunization receive a booster dose upon entry to active duty and subsequently in accordance with ACIP requirements. Navy and Marine Corps only. Typhoid vaccine is administered to alert forces and personnel deploying to endemic areas. Army, Air Force, and Coast Guard (Navy and Marine Corps receive all receive this, regardless of "Alert Status"). Army, Air Force, and Coast Guard (Navy and Marine Corps receive all receive this, regardless of "Deployment Status"). Cholera vaccine is not administered routinely to either active or reserve component personnel. Cholera vaccine is administered to military personnel, only upon travel or deployment to countries requiring cholera vaccination as a condition for entry, or upon the direction of the appropriate Surgeon General, or Commandant (G-K), Coast Guard. There is no requirement for routine immunization. 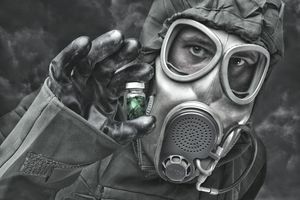 Plague vaccine is administered to personnel who are likely to be assigned to areas where the risk of endemic transmission or other exposure is high. The vaccine may not be effective in the prevention of airborne infection. The addition of antibiotic prophylaxis is recommended for such situations. Rabies vaccine is administered to personnel with a high risk of exposure (animal handlers; certain laboratory, field, and security personnel; and personnel frequently exposed to potentially rabid animals in a non-occupational or recreational setting). This vaccine is administered only under the authority of DoD Directive 6205.3, DoDImmunization Program for Biological Warfare Defense. Army. Members of units, both active and Reserve Component, designated to be in a state of readiness for immediate deployment to any area outside of the U.S., includes units and individuals required to be in a state of readiness for immediate deployment within 30 days or less of notification. Navy and Marine Corps. All fleet units deployed on a scheduled or situational basis to any foreign country (except Canada). These units include all Navy and Military Sealift Command ships (including civilian mariners), aircraft squadrons, Fleet Marine Force units, construction battalion detachments, and naval special warfare personnel. This includes Medical Department personnel assigned to Mobile Medical Augmentation Readiness Teams and other naval personnel, including members of Reserve units, subject to foreign deployment on short notice. Air Force. Aircrew personnel, individuals, and members of units (active, Reserve Component, and Air National Guard ) subject to rapid deployment to any theater of operations by virtue of present assignment or mission function. Coast Guard. Personnel attached to combat or combat support units (WHEC, WMEC, WPB, WAGB, WLB, CGAS), national strike force, members of the Coast Guard Reserve designated by the district commander, individuals or special teams which are available for immediate deployment outside the United States, and any or all members of a unit whose commanding officer chooses to protect and preserve operational effectiveness.